A dominant victory for the World Champion. 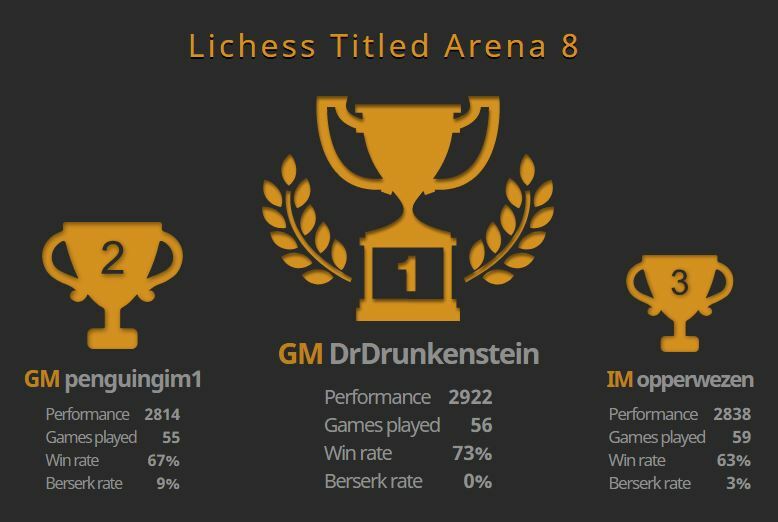 Chess World Champion Magnus Carlsen (DrDrunkenstein) won the Lichess Titled Arena 8 on Friday by an impressive (and fancy) margin of 26 points. It was potentially his last formal chess competition before beginning a World Championship match on November 9th. Finishing second was GM Andrew Tang (Penguingim1), a Titled Arena regular. Third was IM Vincent Rothuis (opperwezen), who always seems to finish towards the top of these events. Fourth and Fifth place were taken by GM Alireza Firouzja (alireza2003) and GM Sergei Zhigalko (Zhigalko_Sergei). In total, 227 players took part. Among many others, streamers included: ChessNetwork, Penguingm1, Zumpili, and John Bartholomew.